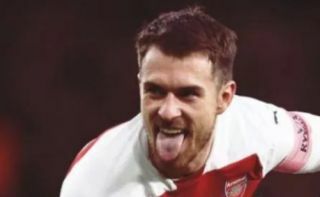 Arsenal midfielder Aaron Ramsey enjoyed a cheeky dig at Tottenham’s Eric Dier after yesterday’s North London Derby win. Arsenal came from behind to beat rivals Spurs 4-2 at the Emirates Stadium, during which a number of players clashed in the first half. Dier’s goal levelled things up for Tottenham, leading to a mass brawl between players on the pitch and on the bench. As noted by the Metro and others, the England international could be seen telling Ramsey in particular to sit down after he got up to join the melee. Who says modern footballers don’t take local rivalries seriously enough, eh?